A price quote from your local pool contractor may include a lot of different expenses that go into building an inground pool, but you may be surprised to learn what it doesn’t include. While not technically part of the cost of building a swimming pool, safety features are a must – and in most areas, they’re even required by law. When budgeting for an inground pool, make sure you include money for any swimming pool safety equipment that isn’t included in the construction price. When it comes to keeping your pool safe, your most important duty is to ensure that children can’t access your pool when no one is around to supervise. Fortunately, there are plenty of pool safety products designed to do just that. They may not be cheap, but given how important pool safety is, they’re well worth the cost. In most areas, the law requires you to secure your pool with a fence of a certain minimum height. Unless you live in a very remote area, getting a fence is something you’ll want to do anyway. You’ve probably heard the statistics about how many children drown or nearly drown in swimming pools every year. A fence is the best way to ensure your pool doesn’t contribute to those statistics. Fencing can be very expensive, but it doesn’t have to be so. You can buy an affordable temporary pool fence to use only during the swimming season. There are several different varieties of inground pool alarms, but what they all have in common is that they’re designed to alert you whenever pool security has been breached. One option is a system that measures water disturbance, sounding an alarm when a person or pet has unexpectedly entered the pool. Alternatively, there are alarms that you can connect to a doorway or fence gate, alerting you whenever someone even gets close to the water. Pool alarms are relatively inexpensive compared to the other options. You can often find them for less than $200. Another great way to make your pool safe is by keeping it covered when it’s not in use. A safety pool cover is a last line of defense that prevents someone from falling into the water even if they get to the edge of your pool. These are not to be confused with other types of pool covers designed to keep your pool warm and/or free of debris. Safety pool covers are specially designed to support the weight of children and pets. 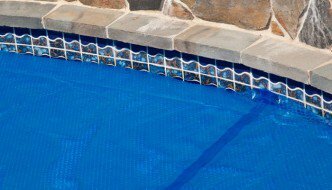 Because of the durable materials they’re made of, safety pool covers can be very expensive. They generally cost a few hundred dollars at a minimum. For maximum safety, you can combine pool safety products to create multiple layers of security. Every pool should have a fence to discourage children from even attempting to approach the pool. However, adding an alarm on the gate – along with a water disturbance alarm or a safety pool cover – makes it that much safer. Of course, the best safety measure is common sense and adult supervision. Keeping an eye on your pool, especially when there are children or pets around, is the most effective way to prevent a tragedy from happening.